A kilt is a knee-length non-bifurcated skirt-type garment with pleats at the rear, originating in the traditional dress of men and boys in the Scottish Highlands of the 16th century. Since the 19th century, it has become associated with the wider culture of Scotland, or with Celtic (and more specifically Gaelic) heritage even more broadly. It is most often made of woollen cloth in a tartan pattern. Kilts have been adopted as female wear for some sports. Setts are always arranged horizontally and vertically, never diagonally (except when adapted for ladies' skirts). They are specified by their thread counts, the sequence of colours and their units of width. As an example, the Wallace tartan has a thread count given as "K/4 R32 K32 Y/4" (K is black, R is red, and Y is yellow). This means that 4 units of black thread will be succeeded by 32 units of red, etc., in both the warp and the weft. Typically, the units are the actual number of threads, but as long as the proportions are maintained, the resulting pattern will be the same. This thread count also includes a pivot point indicated by the slash between the colour and thread number. The weaver is supposed to reverse the weaving sequence at the pivot point to create a mirror image of the pattern. This is called a symmetrical tartan. 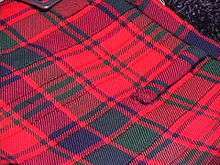 Some tartans, like Buchanan, are asymmetrical, which means they do not have a pivot point. The weaver weaves the sequence all the way through and then starts at the beginning again for the next sett. Setts may be registered with the International Tartan Index (ITI) of the charitable organisation Scottish Tartans Authority (STA), which maintains a collection of fabric samples characterized by name and thread count, for free, and/or registered with the Scottish Register of Tartans (SRT) of the statutory body the National Archives of Scotland (NAS), if the tartan meets SRT's criteria, for UK£70 as of 2010. 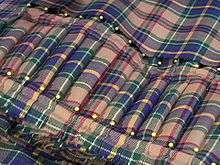 Although many tartans are added every year, most of the registered patterns available today were created in the 19th century onward by commercial weavers who worked with a large variety of colours. The rise of Highland romanticism and the growing Anglicisation of Scottish culture by the Victorians at the time led to registering tartans with clan names. Before that, most of these patterns were more connected to geographical regions than to any clan. There is therefore nothing symbolic about the colours, and nothing about the patterns is a reflection of the status of the wearer. Certain regiments/units of the British Army and armies of other Commonwealth nations (including Australia, Canada, New Zealand and South Africa) with a Scottish lineage or heritage still continue to wear kilts as part of dress or duty uniform, though they have not been used in combat since 1940. 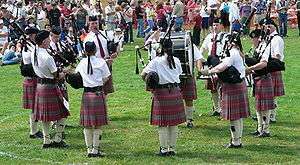 Uniforms in which kilts are worn include Ceremonial Dress, Service Dress, and Barracks Dress. Kilts are considered appropriate for ceremonial parades, office duties, less formal parades, walking out, mess dinners, and classroom instruction or band practice. 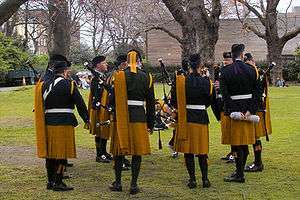 Ceremonial kilts have also been developed for the US Marine Corps, and the pipe and drum bands of the US Military Academy, US Naval Academy and Norwich University – The Military College of Vermont. It is not uncommon to see kilts worn at Irish pubs in the United States, and it is becoming somewhat less rare to see them in the workplace. Casual use of kilts dressed down with lace-up boots or moccasins, and with T-shirts or golf shirts, is becoming increasingly familiar at Highland Games. The kilt is associated with a sense of Scottish national pride and will often be seen being worn, along with a football top, when members of the Tartan Army are watching a football or rugby match. The small Sgian Dubh knife is sometimes substituted by a wooden or plastic alternative or omitted altogether for security concerns: for example, they typically are not allowed to be worn or carried on to a commercial aircraft. There are two Galician tartans recorded in the Scottish registries: Galicia and "Gallaecia — Galician National". 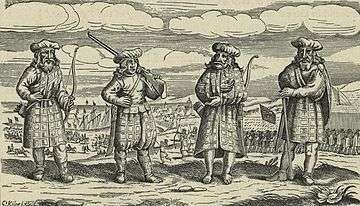 There is historical evidence of the use of tartan and kilt in Galicia up to the 18th century. Contemporary kilts (also known as modern kilts and, especially in the United States, utility kilts) have appeared in the clothing marketplace in Scotland, the US, and Canada in a range of fabrics, including leather, denim, corduroy, and cotton. They may be designed for formal or casual dress, for use in sports or outdoor recreation, or as white or blue collar workwear. 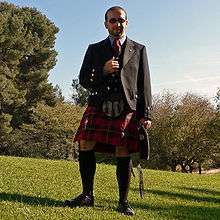 Some are closely modelled on traditional Scottish kilts, but others are similar only in being knee-length skirt-like garments for men. They may have box pleats, symmetrical knife pleats and be fastened by studs or velcro instead of buckles. Many are designed to be worn without a sporran, and may have pockets or tool belts attached. ↑ Hobsbawm & Ranger 1983, pp. 22–23. ↑ Newsome, Matthew Allen, The Early History of the Kilt, The Scottish Tartans Museum . ↑ Newsome, Matthew Allen C (1 July 2005). "On the Confusion of the Kilt as an Irish Garment" (World Wide Web log). Albanach. Clemmons, NC. Retrieved 10 June 2009. ↑ Johnson, Erik. "Costuming Regulations of the Scottish Official Board of Highland Dancing". Margs highland dance wear. Retrieved 13 March 2009. ↑ "The Real Story", The Real Story: What does a Scotsman wear under his kilt?, However, there is nothing mysterious about what was worn below the clansmen's shirts. "You cannae tak the breeks aff a Hielanman! ", runs an old saying, signifying the futility of attempting the impossible! ↑ "Scots Tradition Hit by Cover-Up Ruling". United Kingdom: The Times. 2 August 2004. Retrieved 12 May 2008. ↑ "What's Down Under?". Scottish Tartan Authority. Retrieved 2013-05-30. ↑ Bolton, Andrew (2003). Bravehearts: Men in Skirts. London: Victoria and Albert Museum. ISBN 0-8109-6558-5. ↑ MacMillan, Arthur (26 November 2006). "Top private school bans sgian-dubhs ahead of Christmas dance". The Scotsman. Retrieved 19 October 2009. ↑ "Can I carry sharp-edged religious/cultural regalia/accessories (eg Kirpans, Sgian Dhub or Dirks) on my person or in my hand baggage? ", FAQ, Stansted Airport . 1 2 Newsome, Matthew Allen C (12 June 2008). "The Early History of the Kilt". Scottish Tartans. Franklin, NC: The Scottish Tartans Museum. Retrieved 10 June 2009. ↑ "Irish Step Dancing Costumes". Historical Boys Clothing. Retrieved 25 July 2009. ↑ "Welsh National Dress". St. Fagan's National History Museum. Retrieved 11 June 2008. ↑ "Brittany National", Tartan register, UK . ↑ "Brittany National Walking", Tartan register . ↑ "Bro-kerne", Tartan register, UK . ↑ "Bro-Leon", Tartan register, UK . ↑ "Bro-Dreger", Tartan register, UK . ↑ "Bro-Wened", Tartan register, UK . ↑ "Bro-Zol", Tartan register, UK . ↑ "Bro-Sant-Maloù", Tartan register, UK . ↑ "Bro-Raozhon", Tartan register, UK . ↑ "Bro-Naoned", Tartan register, UK . ↑ "Bro-Sant-Brieg", Tartan register, UK . ↑ "Menez Du". Tartan register. Scotland, UK: National Records. Retrieved 2012-08-21. ↑ Reun-Jezegou. "Un Breton en kilt". Blog4ever. Retrieved 2012-08-21. ↑ "History of the Kilt in Galicia and Other Celtic Nations". Kilt and Tartan Gallaecia. Retrieved 10 June 2009. ↑ "Kilts Dance to New Tune". BBC News. 25 July 2000. Retrieved 10 June 2009. ↑ Harper, Christina. "Revealing a New-Look Kilt for Everyday Wear". Scotsman.com Heritage & Culture. Retrieved 10 June 2009. ↑ Block, Melissa (21 July 2008). "Wash. Mail Carrier Seeks Right to Wear Kilt to Work". NPR, Talk of the Nation. Retrieved 19 February 2010. 1 2 Catchpole, Dan (6 August 2008). "U.S. mail carrier demands kilt uniform option". Associated Press (via USA Today). Retrieved 19 February 2010. ↑ "Tactical Duty Kilt Is Back". PRNewswire. Trevor-Roper, Hugh Hobsbawm, Eric; Ranger, Terence, eds. (1983), The Invention of Tradition, United Kingdom: Cambridge University Press, ISBN 0-521-24645-8 . Tewksbury, Barbara; Stuehmeyer, Elsie (2001), The Art of Kiltmaking, Rome, NY: Celtic Dragon Press, ISBN 0-9703751-0-7 .